This is one of those moths that has moved about a bit. 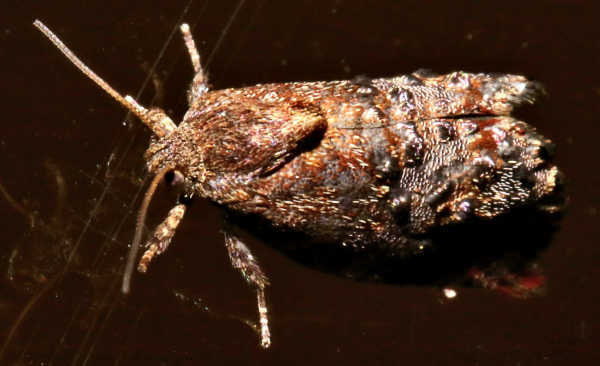 The original genus of Hypertropha was placed in the family Glyphipterigidae (Sedge moths), next it was transferred to Hypertropha in Copromorphidae (fruit worms), next it was placed in Hypertrophidae (twig moths), then reassigned to a sub family of Hypertrophinae in Glyphipterigidae, then moved again to Oecophoridae and finally moved (by I.F.B. Common Moths of Austrtalia P234) to a separate family Hypertrophidae. Although most of the books and internet sites use Hypertrophidae as a family some are still placing the moths in Oecorphoridae. Larval food is most likely Eucalyptus leaves. There is another genus Peritropha, which is sometimes placed in Depressariidae, which is similar, but I think Hypertropha is correct. This weeks post is a little late because we had what could be called "a good bit of rain" during the week. A tropical cyclone ( Debbie) crossed the coast about 1000 Km to the north of us then turned into a rain depression and headed south with heavy rainfall and a lot of local flooding. Hopefully the rain is not too late for the moths to take advantage of the rapid growth in the plants. It has been a very dry summer and this rain is quite late in the season.